Elliot Sandy moved to the top of the goalscoring charts in the Evo-Stik League South Division One Central last weekend. The Corby Town frontman hit a hat-trick in the 4-1 success at Aylesbury taking him on to 23 goals in all competitions this season, 20 of which have come in the league. 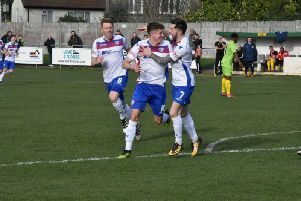 The striker has maintained a prolific record in non-League football for a number of years and his goals this season have helped the Steelmen keep up a push for automatic promotion. And while Steve Kinniburgh is delighted with the goalscoring exploits of his frontman, it’s his overall performance that has impressed the Corby manager the most. “One of the most difficult positions is the centre-forward,” Kinniburgh said. “You get noticed for the goals you score and that’s why I brought Elliot in, I wanted a number nine who would score 20-plus and he’s done that before the end of January, which is excellent. “But you also have the hard work and the nitty gritty part of the game. “When you are under the cosh, you need your striker to hold the ball and make things happen and I think it’s fair to say that his all-round game has been absolutely fantastic. “He has been a pleasure to have around the dressing-room, he has helped build things up in there. And he has set an example on the pitch with his goals and overall performance.